Hosting services are often overwhelmed with technical details that are hardly understandable to common users. Most of us use some simple administrative tools while running websites, but only to a certain extent. It would be impossible to do all hosting job, keep the site updated and refreshed daily with the new content or run an eCommerce website, all that at the same time. Hosting services have been constantly improved, but there are some important factors we have to take into consideration before choosing the hosting provider. An adequate decision spares our time in future and decreases our involvement in matters beyond our knowledge and experience. In addition to that, a lot of time remains us for dealing with the content, readers, and customers which is of utmost importance for business improvement. Ease of use, customer support, and speed are some basic features every reliable hosting service must have. Hosting packages and their prices should be also estimated with your personal needs and preferences. Of course, security is the number one concern when running a website. Securing yours and your clients’ data does matter, and it requires a solid technical knowledge. You might be able to be deeply involved in security issues, and if you think you have enough time and resources to deal with it, that’s fine. A much better option is to lean on Kinsta, a specialized service providing all in one – hosting and security! The main advantage of this premium WordPress hosting is cutting-edge technology covering all aspects of a website. There are different Kinsta plans available, small and large, which cover every business purpose. All plans include expert support of WordPress developers. There is absolutely no need to resolve any issue on your own. Kinsta is a highly secure network with advanced active and passive protocols and firewalls. Daily backups and uptime checks are additional features that guarantee permanent safety. Whichever Kinsta plan you select, you can count on some common features from the startup. Since it was supported by Google Cloud Platform, 18 regional data centers are available for you to choose from. Each plan also includes additional add-ons which are completely optional. They have been designed to provide more power from the beginning. For example, extra backups increase security, and they can be made every 6 hours or even every hour. In the next 24 hours, whatever happens, your backups are stored. Elasticsearch is a tool in charge of doing search and analytics in cases of a growing number of uses. Every plan has an estimated number of visits, but if your website overruns it, there is visits overage add-on which is used to charge a symbolic fee after plan’s visits cap has been hit. The main thing, your website will be running uninterruptedly. CDN overage has a similar purpose. It regulates additional gigabytes for not more than $0.10 per gigabyte, and your website runs smoothly all the time. Kinsta has a powerful administration of fantastic features that are user-friendly and adaptable to any kind of business. It can be customized to those of them that are demanding and with unique requirements. Choosing a solution that is dependable on the support is never a good idea since it will slow down your efficiency and postpone the results. One of the Kinsta’s main goals is to set up the dependency on support to a minimum. Thanks to its best-in-class output, at the time you notice the security issue, it was in the process of resolving or already solved. Every two minutes, the website’s uptime has been checked. The whole system is designed to have everything under control around-the-clock, but if you have any questions or some special needs then you can lean on the support to get the right answers instantly. Basic features of Kinsta fully managed hosting and security service comprise free migrations, ultimate speed, and daily backups. In comparison to many other hosts, the increase in speed and successful handling of thousands of simultaneous connections is noticeable. In a word, Kinsta is clients oriented. It is especially important for eCommerce clients to avoid the jam on their websites. While Kinsta does take care about the traffic, security, and scaling (on-demand), there is plenty of time left for you to work on new ideas how to improve and expand the business and grow earnings. Or you can get involved in a new design of your website. The point is – let the experts do their job and you afford yourself time and space to do what you know the best. Kinsta WordPress hosting is made for everyone. Top quality support that is always available and user-friendly and powerful management belong to Kinsta’s top priorities. The fast and simple installation enables beginners to get along without any difficulties while advanced features are a part of professional solutions for developers. If you run multiple websites, you can gather them in a dashboard overview. All the necessary tools you might need to control your sites have been offered by MyKinsta – a kind of a control center. A wide span of analytics helps you in keeping track of relevant data, separately for each website. Response times, a number of visitors or bandwidth usage are some of them. Most important, this WordPress hosting tool guarantees precision in detail for any kind of website management. Of course, you might not stand alone in your business, and your team may consist of two, three or more people. Use granular access rights (multi-user feature) to lead your team to the next level. In this way, you can split the duties or promote your associates to developers or administrators. The team is successful if everyone does his job and has their responsibilities. 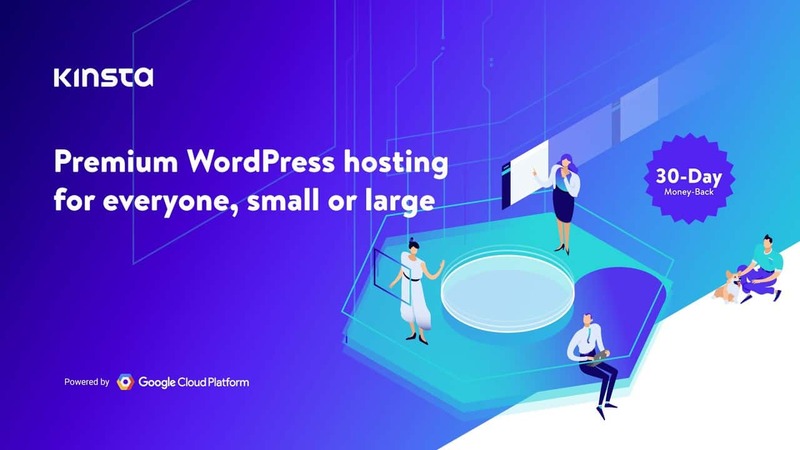 What makes Kinsta more and more popular host and security provider is the fact that it is empowered with the complete, 100% managed WordPress solutions. Thanks to it, automatic software updates and security patches are understandable to common users. Whether your website represents your business or a blog, uptime and speed are the factors that affect your performance on the Internet. With multiple levels of services, Kinsta can boost your website success. How Kinsta makes it is a result of 10 years of experience with WordPress plus cutting edge technology that enables each website to load in less than a second. If you are in search for the best available WordPress hosting solution, you can stop here and explore all the benefits. The first one is the high-security network. There are a lot of measures one could undertake to stop malicious attacks before the damage was done, but Kinsta does it another way. Its continuous monitoring of everything a website consists of prevents harm on the level of intention. Precise detection of DDoS attack, keeping an eye on hardware firewalls, uptime, and SSL support are a part of 24/7 full security. By using the best hardware and software technology, Kinsta is always compatible with the framework of its users. Last versions and updates enable that. Premium Google Cloud Platform transports your data over the fast and secure network based on 18 global data centers. Distance isn’t an issue that might affect the speed, as well as the free site migrations won’t initiate any downtime. An expert migration team is in charge to do everything right, starting with the temporary domain where your migrated website will be thoroughly checked and diagnosed before going live. Kinsta top-quality features include regular uptime checks every 2 minutes, backups, automatic scaling, and hack guarantee. 720 daily checks of each website are more than enough to provide you with absolute security. Kinsta’s proactive role solves the problems in advance. Speaking about the backups, they have been done daily, and in the worst case, reinstating of a backup is only one push of a button away. How simple and convenient is that? Live and staging backups keep the development safe, and nothing will be lost. As a special requirement, the backup frequency can be changed to every hour or every 6 hours, especially if the website undergoes often changes. It adds to the security and brings you a peaceful mind while preserving the dynamic of the website. Kinsta’s powerful infrastructure is based on Google Cloud Platform. This up-to-date technology is close at hand to enable the customization to your personal needs. Traffic surges cannot be 100% predicted but the solution is to expect them and to be prepared to handle it immediately. Proactive prevention of hacks means that server software is in charge of monitoring the events over the network. Every suspicious activity has been checked instantly, and although the hack is hardly possible, even if it happens, there is no place for panic. Kinsta’s expert team fixes it as the top priority. Your website will be recovered to a perfect working condition as nothing has happened. It is possible thanks to the years of experience with all kind of WordPress issues. Running websites requires time and constant worries about security. It is a full-time job one could hardly afford while investing the effort in growing business. Over time, you will encounter many situations you cannot handle at once and as fast as needed. Yet this is exactly what Kinsta covers all the way from the beginning. It is always one step ahead, preventing security issues before they happen. The highly proficient support team of WordPress experts is 24/7 ready to respond on your call. Live assistance is a far better option than the scripted replies. Thanks to the fast response, the solve rate is 100% successful. The constant monitoring of the website status enables the team to work on the issue long before you give them a call. The key factor is that the status of both systems (internal and external) have been monitored according to the highest standards. Moreover, servers are fully operational and constantly improved as well as the whole system. For that reason, Kinsta is absolutely stable, especially when working with large enterprises. Uptime is not at all an issue, and it is noticeable with WooCommerce websites that are very demanding. From the users’ point of view, the unified management dashboard is as simple as it may. This user-friendly interface enables several operations, such as adding a new site, cloning a WordPress site or developing a staging server. Migrations have never been easier, and detailed analytics is transparent and comprehensive. You can continue using all the tools you are used to by a simple click. The advantage is to have it all at one location, in the control center for all your websites. Of course, all features are extendable from the beginning on the special request. In the end, a wide range of solutions is at your disposal. Choose a plan that fits your business or ask for more information on some special requirements.